Regression Estimators: A Comparative Study presents, compares, and contrasts the development and the properties of the ridge type estimators that result from both Bayesian and non-Bayesian (frequentist) methods. The book is divided into four parts. 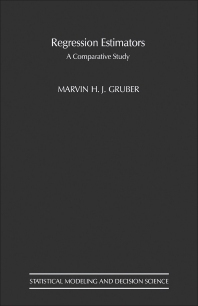 The first part (Chapters I and II) discusses the need for alternatives to least square estimators, gives a historical survey of the literature and summarizes basic ideas in Matrix Theory and Statistical Decision Theory used throughout the book. The second part (Chapters III and IV) covers the estimators from both the Bayesian and from the frequentist points of view and explores the mathematical relationships between them. The third part (Chapters V-VIII) considers the efficiency of the estimators with and without averaging over a prior distribution. Part IV, the final two chapters IX and X, suggests applications of the methods and results of Chapters III-VII to Kaiman Filters and Analysis of Variance, two very important areas of application. Statisticians and workers in fields that use statistical methods who would like to know more about the analytical properties of ridge type estimators will find the book invaluable.